One of the things I LOVE to do is sort through my boxes of old recipes. I do this when I’m looking to spice up our menus every now and then. I even throw some recipes out. I mean I look at it and ask myself what I was thinking when I saved it!! The other thing I LOVE to do is taken previously so-so recipes when the were made alone and combine them together to make a WHOLE new recipe. Many times the new recipe does NOT resemble either of the original recipes in ANY way except the name and main ingredients. Part of the beauty of this recipe is the almost charred onions and the flavor they lend to the chicken AND the rice! THIS IS ONE OF THOSE RECIPES! 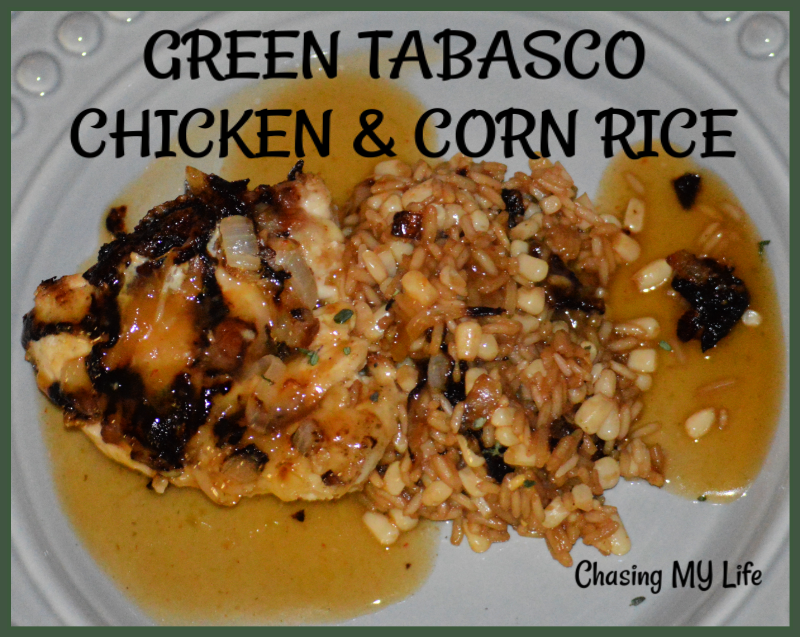 Inspiration hit me and turned 3 recipes (a so-so roast chicken Tabasco, a so-so slow cooked rice along with a so-so baked corn) into a super FLAVORFUL GREEN TABASCO CHICKEN & CORN RICE recipe. In a saucepan combine the wine, sweet and sour sauce, hatch chiles and green Tabasco sauce. Bring to a SLOW boil. Turn to low and simmer while you prepare everything else. After you put the chicken pieces in the skillet make a slurry of the cornstarch and water. Whisk into the sauce and simmer until begins to thicken. JUST before serving you can strain out the larger chile pieces if your prefer. In another sauce pan combine the broth, a few drops of green Tabasco sauce 1 teaspoon of the minced garlic and rice with a pinch of salt. Bring to a quick boil. Immediately reduce to low and simmer 15-20 minutes, stirring occasionally until all the liquid is absorbed and rice is tender. Add avocado oil to a HOT skillet over medium high heat. Add onions and saute until soft and beginning to caramelize. Add garlic, cooking a couple minutes more. Add 1 tablespoon melted butter, stirring to combine. Generously season chicken pieces with FRESH ground salt and pepper. Dredge chicken pieces with WONDRA. Add chicken pieces on top of onions and sear for several minutes before flipping to sear the other side. Stir onions into the rice and add a scoop of rice to each plate.